After looking through the dozen or so announcements of Windows 8 laptop-tablet hybridsat IFA 2012, I’m having trouble telling some of them apart.Sure, some offer unique concepts, like the swiveling Dell XPS Duo 12and the sliding Toshiba U925t, but many PC makers are following a formula that already seems tired: Throw some next-generation netbook specs into a fairly slim tablet, attach it to a hefty keyboard and trackpad dock, and borrow aesthetics from the MacBook Air when possible. It’s now quite clear why Microsoft wanted to build its own Surface tablets: It needs a product that stands out. I’m not saying that the hybrids on display from third-party PC makers don’t look any good. In general, I like the hybrid concept even at its most basic level, and I look forward to trying out some of these devices out when they launch alongside Windows 8 in October. Besides, the modular PC is still a fairly new concept, so there’s inherently a feeling of novelty in what PC makers have come up with. But when you try to compare Samsung’s Ativ to Asus’ Vivo Tab to Hewlett-Packard’s Envy X2 to Dell’s XPS 10, everything starts to blend together. Inevitably, PC makers will have to differentiate by racing to the bottom in price while trying to resist cutting away on the little things, like a decent keyboard and trackpad or a big enough battery. We still don’t know all the details on Microsoft’s Surface RT and Surface Pro tablets, but we do know that it’s unlike anything that PC makers have come up with. The chassis is made not of cheap plastic or MacBook-style aluminum, but of magnesium alloy. Instead of relying on a bulky keyboard dock to stay upright, it uses a built-in kickstand. The ultrathin keyboard doubles as a screen protector, so it’s always there, but never adds much bulk. 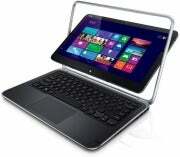 Whereas PC makers’ creations seem like modified laptops, Surface is a tricked-out tablet. Some speculation exists that Microsoft only went ahead with Surface after looking at PC makers’ designs and feeling unsatisfied with them. After doing some looking of my own, I believe it. Though PC makers seem perfectly capable of handling Microsoft’s hybrid OS, they don’t seem particularly inspired by it. It’s funny, but not surprising, that we need a software company to crack the mold.